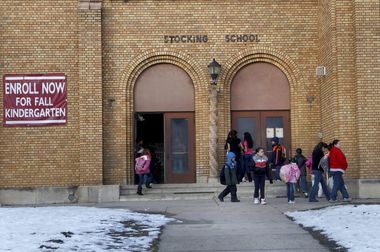 Grand Rapids Stocking Elementary closed last year. The city of Grand Rapids is exploring acquiring the proper for some community type of community use, or combination of community use and private development. GRAND RAPIDS – At the request of the city of Grand Rapids, the school board agreed tonight to delay the process of selling the Stocking Elementary school property until Jan. 31. City officials want to continue to explore the possibility of acquiring the property for some type of community use, or combination of community use and private development.The original agreement with the district, granted in February, ended July 31. The school, located at 863 Seventh St. NW, closed last year. City leaders say park and green space on the West Side is much needed. The property was appraised for $535,000 but the city would need to raise more than $1 million to cover demolition and park development costs. The city has been in discussions with Bruce Michael, a developer who has expressed interest in the site, about partnering with the city on developing it into park. In June, the school district agreed to sell three other elementary schools to Michael, owner of Ojibway Development and his Minnesota partner, Dominium Development and Acquisition, for $1.6 million to convert into apartments. He has been working with city planning staff on developing Oakdale, Lexington and Eastern school playgrounds into neighborhood parks. Under the agreement, the police department would continue to provide additional police patrols of the school property to help minimize vandalism. If vandalism does occur, the city and Grand Rapids Public Schools will share any repairs not covered by insurance.